MANILA, Philippines – A two-star general was put on a hot seat after critics questioned her qualifications as the newly appointed chairperson of a compensation board tasked to determine who were victims of Martial Law that deserve compensation. This came after President Benigno Aquino III appointed police general Lina Castillo-Sarmiento to head the Martial Law Victims Claims Board. Lawmakers and human rights groups expressed dismay over the President’s appointment of Sarmiento and vowed to seek intervention from the Supreme Court to reverse the Palace decision. Senator Joker Arroyo appealed to Aquino in his open letter to the broadsheet Philippine Daily Inquirer to re-examine the basis for the appointment of Sarmiento. Arroyo said Sarmiento’s track record on human rights today does not qualify her to the position as she was never involved in human rights advocacy during the Martial Law years. “The appointment of a general from the uniformed services to preside as chair over the adjudication of the claims for reparation and recognition of the human rights victims is a stinging repudiation of our 15 years of struggle for freedom and democracy, which culminated in the national incandescence at EDSA,” the elder lawmaker stated. Colmenares said that under former President Gloria Arroyo, Sarmiento headed the Philippine National Police-Human Rights Affairs Office (PNP-HRAO). “General Sarmiento openly defended former President Gloria Arroyo from charges of human rights violations and extra judicial killings, practically tolerating the human rights record of the Arroyo regime,” he stressed. Must have a clear and adequate understanding and commitment to human rights protection, promotion and advocacy. Meanwhile, former Bayan Muna Rep. Satur Ocampo and members of the Samahan ng mga Ex-Detainees Laban sa Detensyon at Aresto (SELDA) filed a petition for certiorari before the Supreme Court to ask the high court to nullify Sarmiento’s appointment. “Compensation is a component of justice. Re-writing the history of human rights violations during the martial law regime is the bigger picture. By appointing a former police general to head the Human Rights Claims Board, the President is practically exonerating the entire system that perpetrated the abuses, justified their occurrence, and concealed them with a veneer of impunity,” it added. Senator Arroyo, Colmenares and Ocampo are among those who experienced torture and detention by the Philippine Army and Philippine Constabulary, where Sarmiento was a member. “We want to mark it in our history that never again shall we allow perpetrators of human rights violations go unpunished. Letting a Martial Law relic head the Human Rights Victims Claims Board is a betrayal of that purpose,” Ocampo stated. 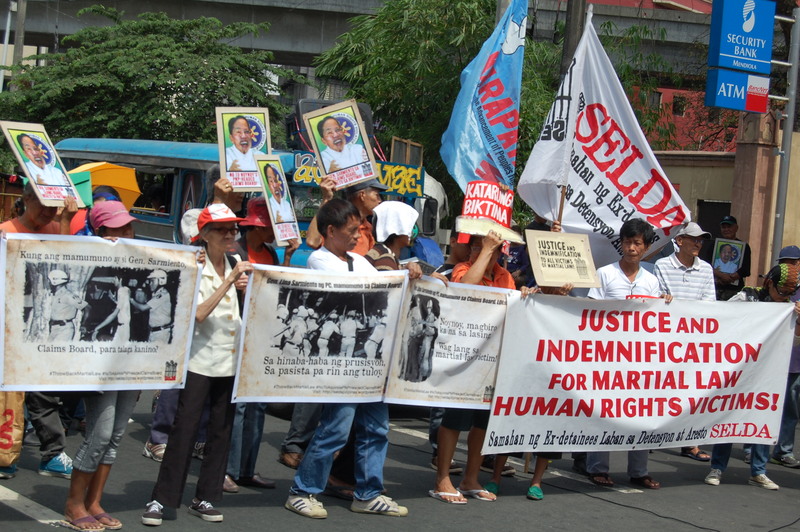 According to SELDA, there are about 10, 000 victims of human rights violations under the regime of former President Ferdinand Marcos. RA 10368 was signed into law by President Aquino on February 2013 on the occasion of the anniversary of the historic People Power uprising that ousted the dictator president.